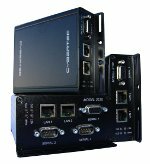 The Cybertec Series 2000 3G/NextG modem/router is the 2nd generation industrial 3G communication solutions designed by Cybertec. The Series 2000 modems have been designed for industrial & commercial use. Applications range from simple data telemetry projects to large scale machinery switching. They have also been designed into systems for use in remote & isolated locations. The Series 2000 contains a HSUPA modem which currently has an download bandwidth of 7.2MBit/s and upload bandwidth of 2MBit/s. The higher upload speeds of HSUPA connections allow for better support in bandwidth intensive technologies such as video transmissions. The Series 2000 also supports a range of 3G frequencies in two different variants. The 'W' variant of the Series 2000 modems will allow connection to carriers utilising the 850MHz or 2100MHz networks. The 'E' variant allows connection to the 900MHz or 2100MHz networks.